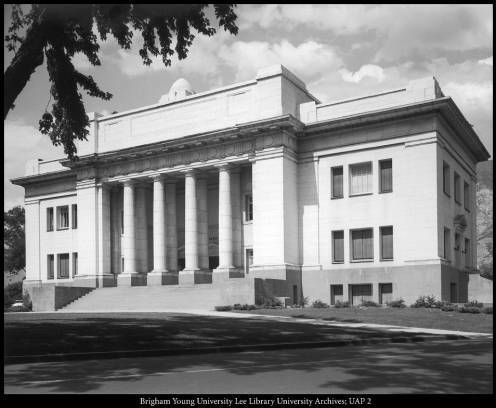 Completed in 1911, this building is one of the most memorable and well-known buildings on BYU campus. Its marble exterior, giant columns, and dark wood highlights inside project an elegance that is lacking in newer buildings around campus. It has been used for many varied purposes, ranging from business classes, to a library, to administrative offices, even army housing and other classrooms. It stands as a memorial to Karl G. Maeser, a giant in the history of BYU. Who was Karl G. Maeser? In front of the Maeser Building on BYU campus, there is a large stature of Karl G. Maeser and commemorating Maeser’s dedication to the school. Occasionally, a chalk circle is drawn around the statue to celebrate Maeser’s declaration of honor. This is meant to represent the commitment to honesty and truth that students at BYU are expected to follow. 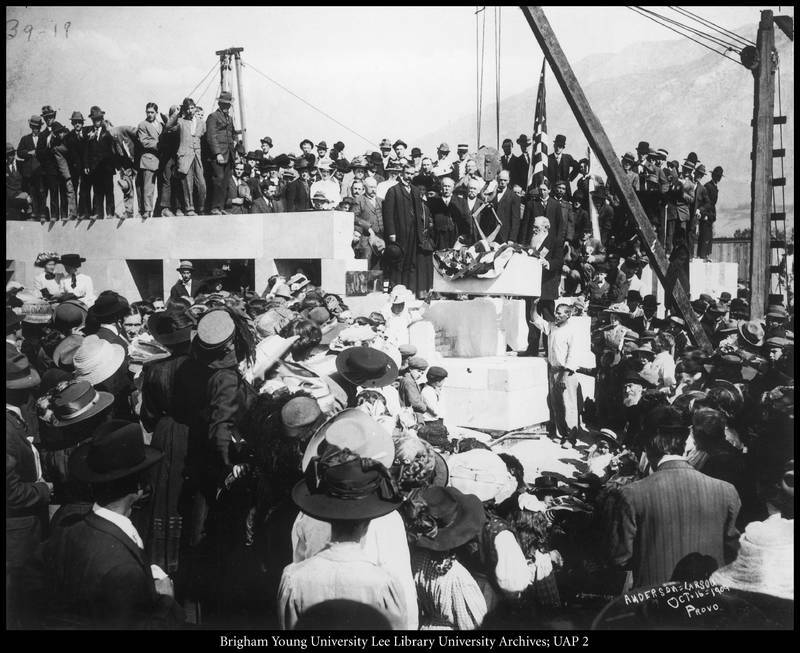 After the death of Karl G. Maeser, the prominent LDS educator and former head of Brigham Young Academy, leaders of the small school desired to make a building to commemorate Maeser’s efforts to build the school. They started raising money from local donors (notably from Jesse and Amanda Knight). Even the student body helped raise money for the purchase of the hill and the construction of the building itself. Originally, school administrators had planned on building this commemorative building in lower campus, close to the Academy building (now the Provo Library), but the purchase of Temple Hill changed these plans. They decided that this building was to be a beacon to the world of light and education. Construction on this massive building began in 1907 and took four years to complete. On May 30, 1912, school officials, local leaders, and family of the late Karl G. Maeser gathered to dedicate this building. It had cost over $130,000 to complete (approximately $2.1 million in 2017). Over 1600 people contributed money to this effort, with a large donation provided by the Knight family. Initially, this building was intended to house classrooms, some offices, and permit large school gatherings in the assembly hall. However, in its 100 years of existence, it has served many unusual uses. Just a few years after its dedication, the Maeser building was turned into Army barracks, housing the Student Army Training Corps. These were volunteer soldiers who responded to the call to serve as the United States entered the First World War. 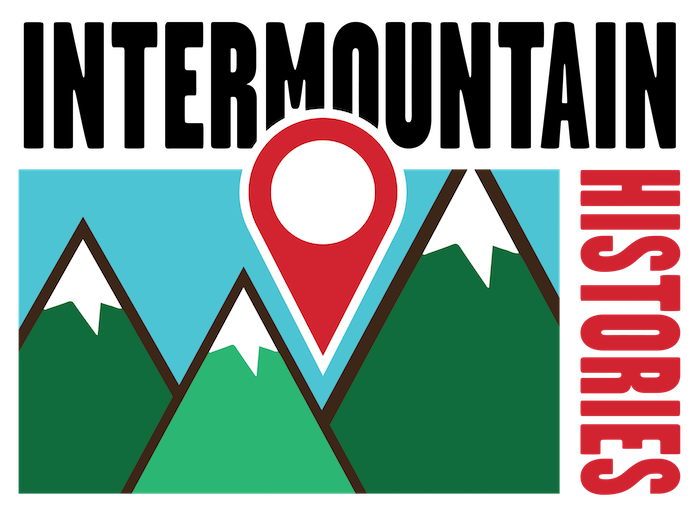 This Corps were created all across the country to help offset lower enrollment in universities as young students headed to Europe instead of college. Close proximity to US soldiers helped to drive patriotic drive among local citizens as well, which spurred the purchasing of Liberty bonds to help fund the war. Originally, soldiers were sent to live in the Maeser building to temporarily quarantine them from an outbreak of Spanish influenza. After the danger abated, soldiers were simply ordered to stay there. The limited space in the Maeser building provided cramped living quarters, though school administration soon began to build the Mechanic Arts building to alleviate the cramped quarters. That building would later be named the Brimhall Building and house the School of Communications. 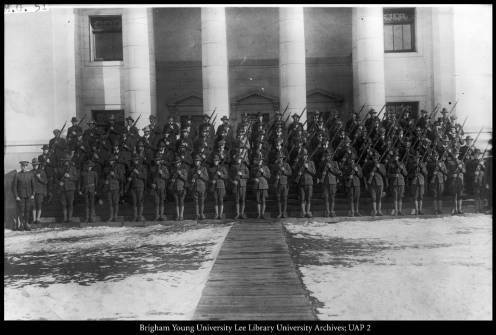 Classes were suspended at BYU until January 1919, when the war had ended and the soldiers were able to return home. 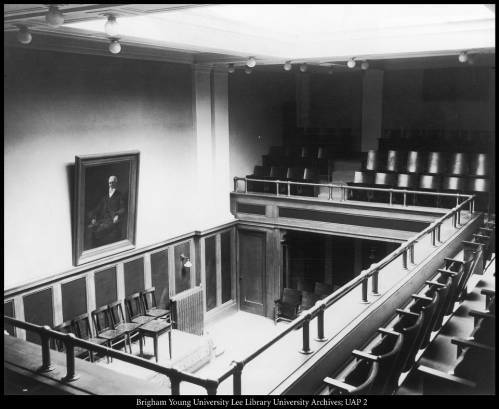 Some BYU officials envisioned the Maeser building as an administrative building, a dream that became more feasible as more of upper campus was developed. By 1931, additional buildings allowed executive office to be moved from lower campus and the Academy building to the Maeser building. The President of the University moved his offices to the Maeser, followed by the purchasing department, the treasury department, the registrar and student registration. Space was allocated at a premium as the school continued to grow and more administrators were needed manage the larger student body. Doors leading to hallways were locked, and desks moved into hallways to create more office space, though in tight quarters. Books and papers were stashed wherever they could fit, as the library soon ran out of room. Soon, the Steno Bureau, the organization of secretaries, was moved into the basement of the building to be closer and more accessible to the main administration and the President. The BYU Press, responsible for many of the campus newspapers, took residence on the first floor, directly under President Harris’s office. By the 1930’s the expansion of campus led to the addition of telephones, ushering in a new age of technology. This expansion led to the need for more workers to clean and maintain the buildings, as the handful of maintenance workers were insufficient to meet the growing needs. BYU President Harris began the practice of hiring students as custodians, a tradition that continues to this day. 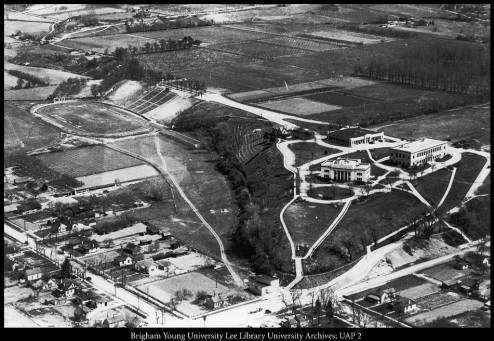 By the end of the Second World War, even more space was needed on BYU campus. The main assembly room, previously used for staff meetings, was demolished and more offices were crammed in. 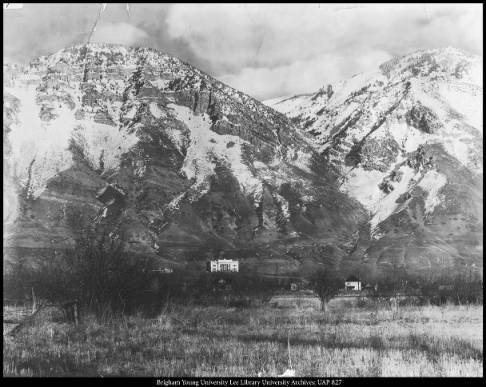 During the population boom following the war, even more students applied to and were accepted into BYU, leading the administration to build more buildings. Notably, they completed the Abraham Smoot building, farther up in upper campus to serve as the new administrative offices. Its cross design was made to allow more natural light to permeate the building. As administration moved north, more space opened up in the Maeser building. It became the home for many departments and school on campus. The English department stayed on the second and third floors for a few years, followed soon by the History and the Political Science departments, who split the northern and southern sections of these two floors. The Archaeology department occupied the first floor until its move in 1983. History left in 1974 and was replaced by the joint French and Italian department. The German department replaced the Political Science department, focusing the building on the study of languages and archaeology. However, between 1981 and 1983, the building was vacated, designated for restoration by the board of trustees. Almost the entire building was gutted during restoration, preserving only the outside walls. It was completely remade, styled to recapture the original feel of the building. Accommodations were also made to incorporate modern technologies. Now, the Maeser building houses the BYU Honor program. This program is dedicated to developing students to be leaders and thinkers in the world. They carry on Karl Maeser’s vision and teachings of dignity and dedication in education as they strive to be the best students that they can. Designed to be the light on the hill, the Maeser building is a testament to the standard of education set by Karl G. Maeser. It recalls the school’s early days of struggle and looks forward to an even brighter future. 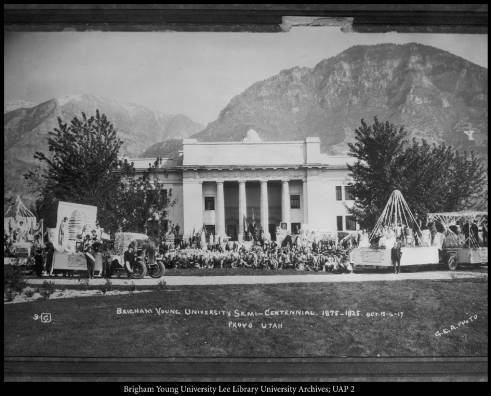 Josh Franzen, Brigham Young University, “Karl G. Maeser Building,” Intermountain Histories, accessed April 19, 2019, https://www.intermountainhistories.org/items/show/136. Gardner, Peter. 100 Years on Temple Hill, from BYU Magazine. Brigham Young University. 2011. Connelly, Ethel. Young Woman’s Journal. Church of Jesus Christ of Latter-Day Saints. 1912.